Just as dahlia season is winding down, some new dahlias have come into bloom that will last year-round. 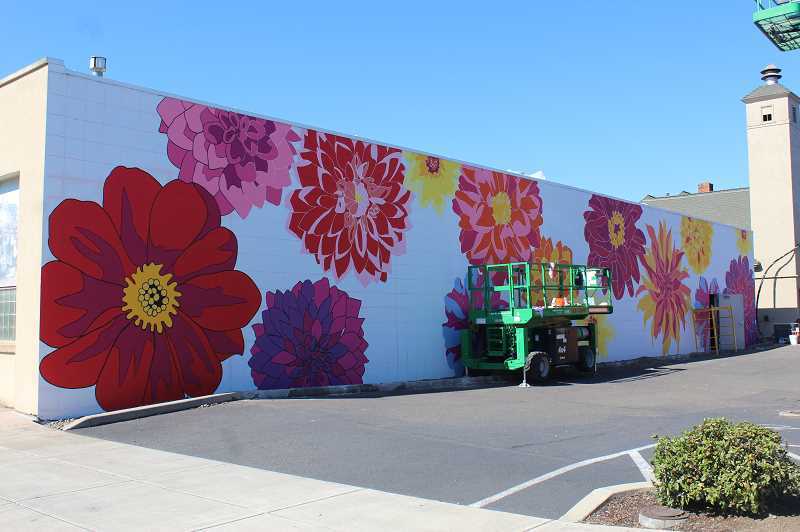 A large, colorful dahlia mural is nearing completion on the backside of the old police station on Northwest First Avenue in Canby. The old police station, along with the new Dahlia building, the old city hall and the former Canby Utility building, is owned by Hanlon Development. The company worked with New York artist Jan Testori to bring the mural to life. Testori, who in addition to being an artist is also a restauranteur, actually visited town to scope out the possibility of replicating one of her New York restaurants in Canby. It was then that she saw the large blank wall on the abandoned building, practically begging for paint. "As an artist, when I saw that wall it seemed like a giant blank canvas waiting to be painted," Testori said. "I learned about the dahlia farm nearby, and I proposed to the developer that they do a mural of Dahlias. That's how it all came about. "The hope is that it will bring more positive attention to this lovely town, that it will make passersby smile and provide a great backdrop for some selfies," Testori added. With the design from Testori, Mary Hanlon of Hanlon Development enlisted Arturo Gonzalez and his team to carry out the painting. "I think it adds some color to the area," said Amelia Kuenzi, The Dahlia property manager. "A lot of these buildings are older, and I think just having a really good pop of color is what a lot of people are liking. From upstairs, you can actually see down, from apartments, to see the really pretty mural." Hanlon couldn't be happier with the mural. "They're actually my favorite flower…I don't know how [Testori] did it, but I think she knocked it out of the park," Hanlon said. As the Dahlia building is open and mostly complete, Hanlon pointed out that the painting of the mural keeps the momentum going in the company's overall goal of renovating the whole block on First and Second Avenues between North Ivy Street and North Holly Street. "I think the mural sort of represents what we want to do, which is breathe new life into that block," Hanlon said. "We're hoping that it becomes a destination location," she added. Once the mural is finished, the next step is fresh landscaping between the Dahlia and the old city hall, which Hanlon said she hopes to have finished by spring. Once renovated, the garden space will boast a walking path, trees, bushes and more for both tenants and downtown visitors to enjoy, according to Kuenzi. As for the Dahlia itself, Hanlon has a vision for what kinds of businesses she'd like to see filling the downstairs spaces. Butting up to the garden, she imagines having a wine tasting room or something similar. In the space on Ivy, she hopes to see a restaurant come in. And in the other spaces, she'd like to see retailers such as a toy store, gift shop or boutique. She said the Canby Utility building may house office space, of course Modest City Brewing will likely fill the old police station and the future of the old city hall is yet to be seen. But Hanlon has ideas for that space too. First of all, she has been working with local historian Carol Palmer to ensure that renovations on the outside of city hall meet historic standards. But the inside will be all new. She hopes to find a creative reuse of the old jail, such as having an ice cream scoop shop in that space. With all the change, Hanlon said that she has made it a priority to do everything right, and her goal is to maintain Canby's pleasant and quaint downtown feel. "It's a really great project. It's such a neat opportunity," Hanlon said. "Canby is wonderful. It's such a quiet, beautiful town."